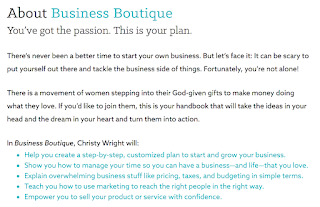 I recently stumbled upon a new resource that I am so excited to share - Christy Wright's Business Boutique - a book and series of women focused events to provide guidance on making a living doing what you love. I didn't know what I was getting myself into when I signed up for this seminar a few weeks ago, but as soon as I arrived, I could feel the energy in the room, and I knew I was in for something special. 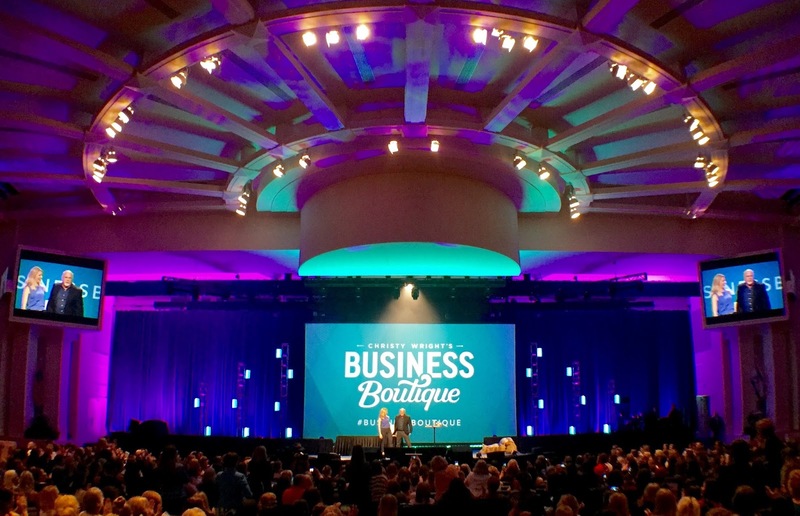 This one day engagement was put on by a group of amazing speakers with firsthand knowledge and advice about being a successful entrepreneur. I didn't know much about Christy before this event, but now I can't get enough of her insight and encouragement. Here are some of the inspiring notes I jotted down from that day. Plus, a giveaway (more on that below)! 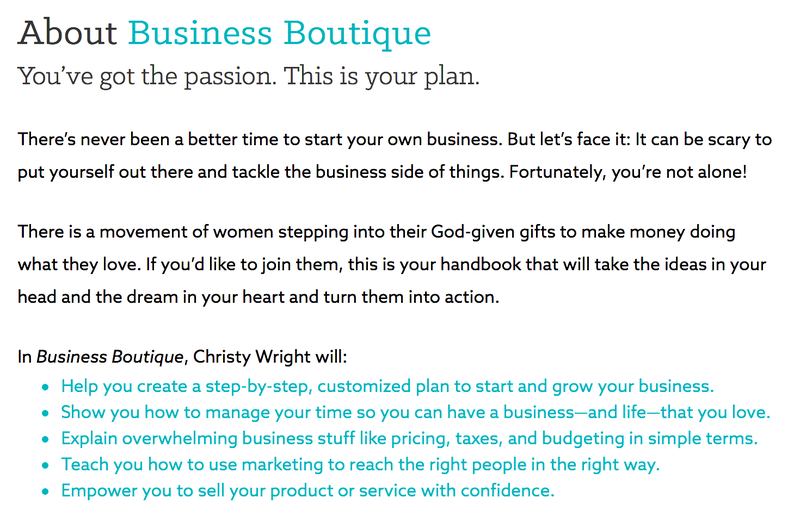 BUSINESS PLAN: This important too helps you shape your business idea into a viable opportunity. It should be a working document that outlines your business foundation, what makes your entity unique, how you plan to setup shop and strategies for marketing. YOUR WHY: Identifying Why you want to go into business for yourself and Why you want to offer specific products or services should be at the heart of setting out on this journey. You want to have a Why that people can buy into. My Why for launching Crafting Exposure is the chance to help artists further their business and exposure to more successfully make a living off their creative passions. 1) What comes Easy to you? 3) What gives you Energy? 4) What do other Encourage? 5) What do you Excel at? COMPETITION: When it comes to competition, you should be mindful of what you'll come up against in the marketplace, but don't let these other entities discourage you. As Christy puts it: "There's room for you too!" The key is making your products or services unique to you and your market. If you show them why you're in business and make them care, you can find success regardless of the competition. TIME & SPACE: Even if you're the most disciplined person in the world, you are more likely to be more effective as an entrepreneur if you set aside a space for working and a specific schedule for accomplishing your goals. You don't have to work harder if you can work smarter. Know what tasks you need to complete, outline time to do so, and you will be able to build the business you've dreamed up. PRICING: The costs of your goods and services should be based on value of what you're offering. Don't be afraid or embarrassed to ask for money in exchange for your time, effort, expertise and materials, but keep in mind what your target is willing to pay. FINANCES: Every business idea will require funds to get off the ground. Consider how you will support your ideas until you're bringing in enough income. If you can avoid going into debt to start your business, the likelihood of success is much greater. Have a budget that accounts for the supplies you need, and be smart about your investments (what equipment you buy versus renting, quality versus cost of supplies). Keep track of your expenses and earnings to see the efficiencies in your business and understand your opportunities for more revenue. Why do your potential buyers need what you offer? Why should they care about you versus other options? RELATIONSHIPS: Sales doesn't have to be an uncomfortable, pushy experience. If you build relationships and offer something that solves a need, you will be a natural choice, not an unwanted solicitation. You just have to put in the time to get to know the people you'd like to serve. Understand their problems and speak to those needs. CONFIDENCE: Being an entrepreneur and marketing your business requires confidence. If you are shy, nervous, introverted or otherwise feeling held back, the best option is to practice. The more you get used to being confident, the easier it will become. Sometimes you have to fake it and not show your doubts. More often than not, you'll feel more comfortable once you just do it! FEAR: If you feel fear at any time in setting out on your own venture, this is normal; it's because you care and you are about to take a bold step forward. Know that both success and failure are possible, but choose to have faith and be open to learning from any unexpected turnouts. No one gets everything right the first time or even the second time. The goal is to take each experience as a stepping stone whether you're triumphant or sent back to the drawing board. I hope some of the above points speak to you and offer guidance in what you're facing at this phase of your creative business. 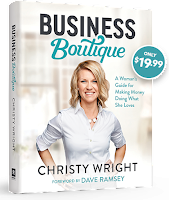 You can find many more insights at one of the Business Boutique events or in Christy's book - which by the way, I am offering now to one lucky winner. 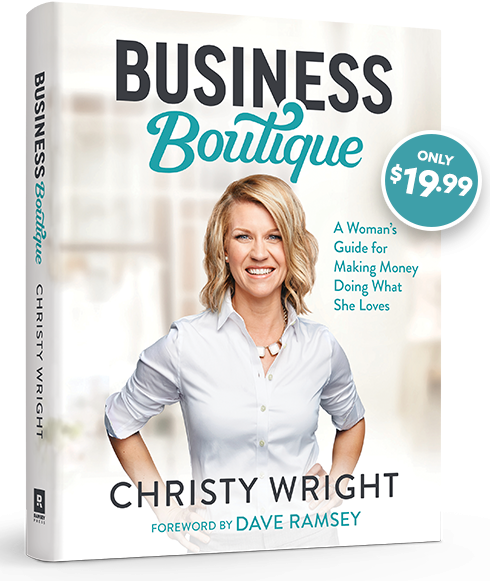 Enter my Business Boutique giveaway to win both the book and an accompanying DVD. You have until May 14th to enter, and the lucky entry will be chosen by the end of the month. If you have any questions about these insights and how to apply them in your creative business, let's chat!